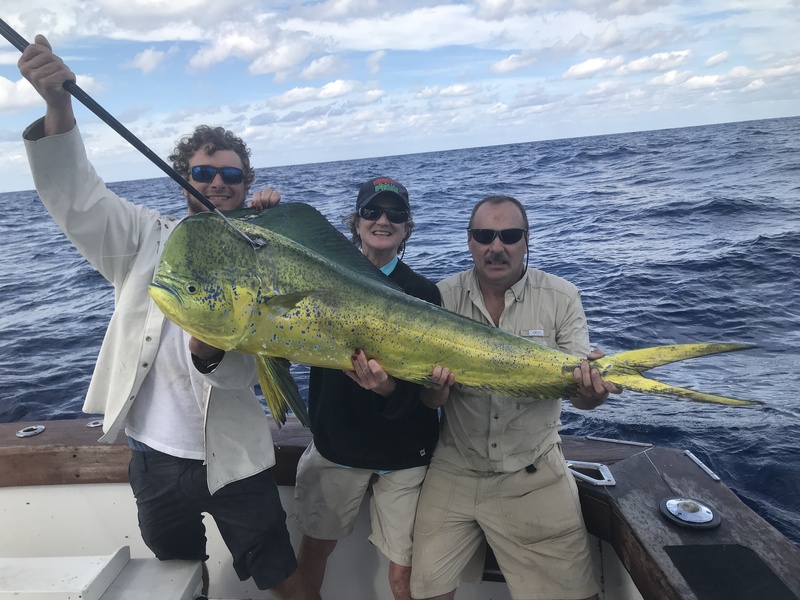 Huge bull dolphin caught by Dan and Pat Okee on their Ft Lauderdale fishing charter. WOW! 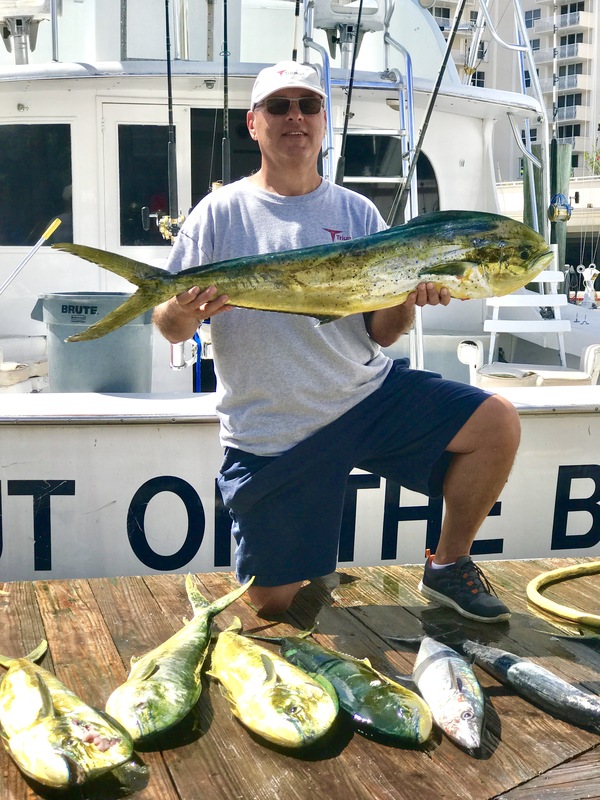 It’s been an awesome month of mahi-mahi fishing in Fort Lauderdale. Our dolphin fishing charters have been perhaps the best I have seen in over a decade. The strong East winds blowing for many days concurrently is most likely the reason for the extraordinary dolphin fishing we’ve been experiencing. When the winds blow from the East for more than a few days in a row, the dolphin get blown in closer and closer to the reefs. This puts them right in our path for our trolling trips to pass right over them and entice the bite. But this year was a little bit different. We’ve not only caught more dolphin but also bigger dolphin than we normally do. I attribute this to conservation efforts making some headway on the fish populations off our coast. We’ve seen the same thing with groupers over the past couple of years. More and bigger fish than we’ve caught in the past years are biting. It’s a great indicator for our fishing charters for future years ahead. 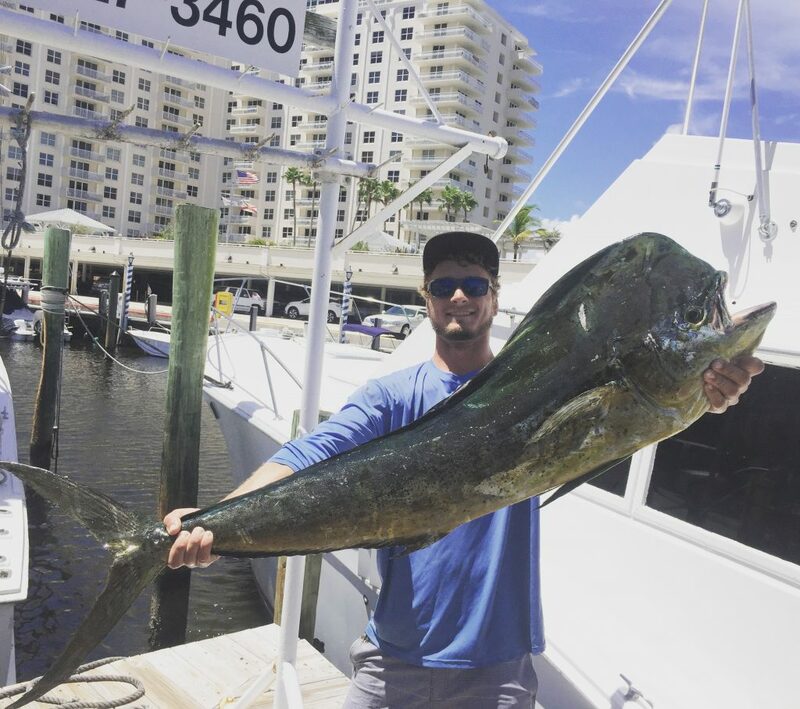 Alex with another huge mahi-mahi caught on our fishing charter out of Fort Lauderdale. Dolphin are normally a gregarious fish. They travel in schools of sometimes a dozen, sometimes a hundred fish. One of the best tricks to catching dolphin in a school is to always leave one in the water. If you do, the rest of the school will stick around and stay nearby the dolphin still in the water (even though he is hooked on the line). This is an awesome tactic because it allows you to take your time and catch literally as many dolphin as you want to, picking them off one at a time. Well, the dolphin this year bit differently. They were not congregated into schools but rather loners, swimming solo for the most part. It was kind of odd this year to find them acting like that. The good thing about that is they were scattered all over the place and much more abundant. 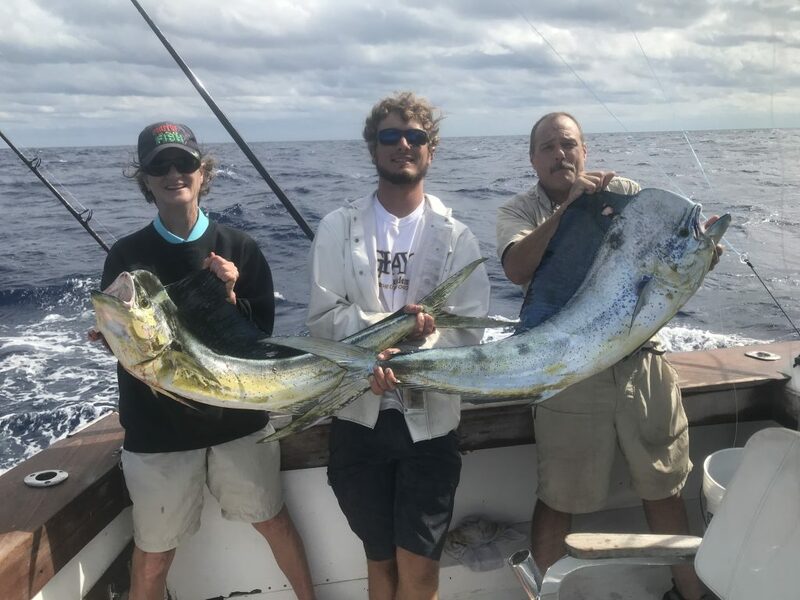 Rather than looking all over the ocean for that one school and loading up on them in one quick slam, we’ve been picking them up throughout the trip, fish action distributed more evenly throughout the trip. I love how they are biting this year. 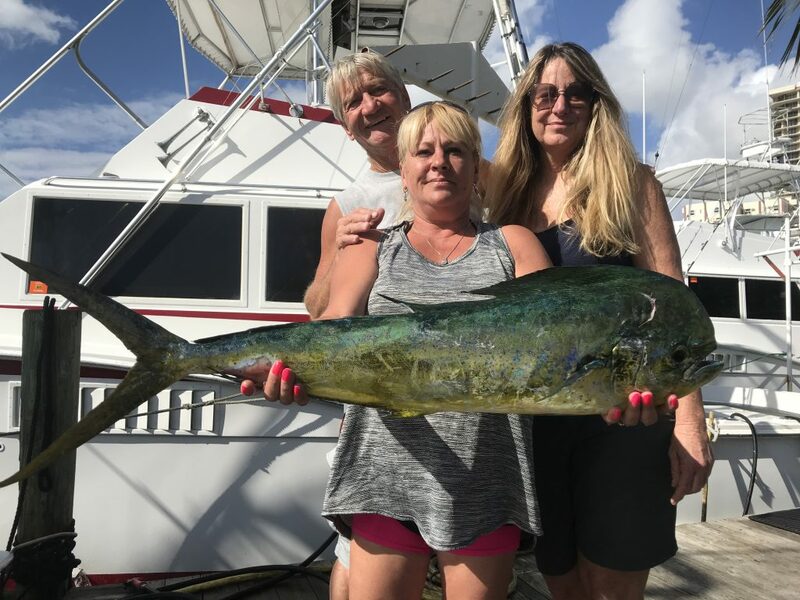 Nice bull dolphin caught by this fisher gal on our deep sea fishing charter. As in years past, the dolphin are mostly 6-12 pounders with the occasional fish over 20 pounds. We recently had a charter that went out and caught several sea monster dolphin over 45 pounds. That’s a monster dolphin. Lots of scattered skipjack and blackfin tunas are biting alongside the dolphin catches as well as a rare wahoo that might hit the deep line. Great action on the pelagic fish this month. Sailfish, a species that is usually biting great for us by this time of the year, have not shown up in great numbers as of yet. This is kind of late for them to not be practically jumping in the boat for us, but they showed up rather late last year too. Fish run in cycles and whether it be El Nino or La Nina or any of the other countless variables that affect the fishing, patterns usually emerge that last 2-3 years and then change. Nice sailfish caught by these happy anglers on our deep sea fishing charter trip. The cooler winds are coming soon. I think there is a cold front due to hit us this weekend. 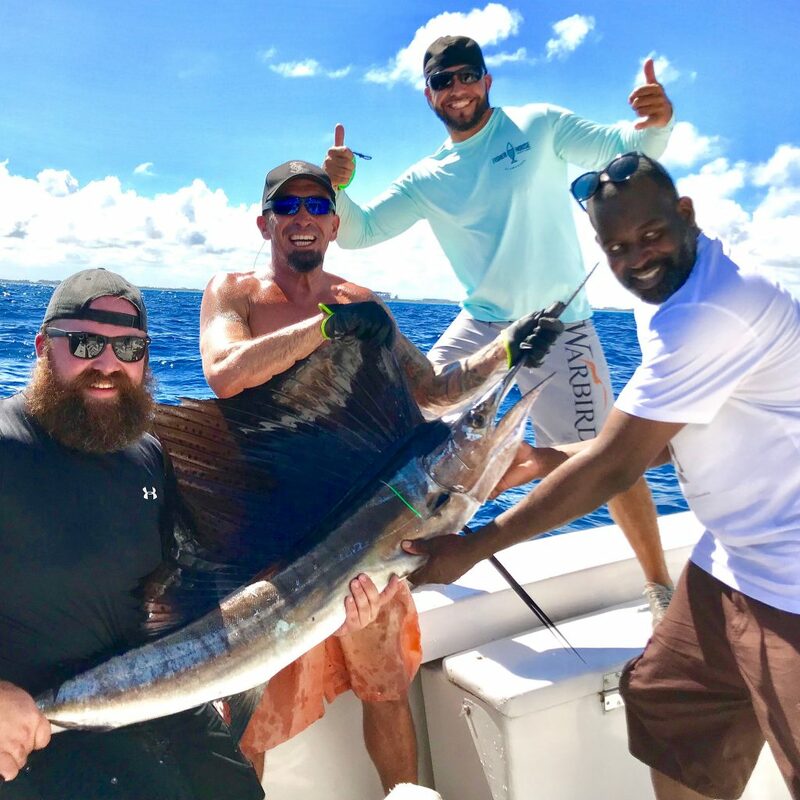 When the weather cools down a little bit more, the dolphin will bite less and less and the sailfish will bite more and more. I’m looking forward to some good sailfish action this year on my fishing charters. Kite fishing is a lot of fun and although not the best technique to get action on the line, it is a great way to catch the very best and biggest gamefish that we have off our coast. I’ll be spending a lot of my time in the coming 2 months with the kites up, 4 goggle eyes dangling on the surface of the water, waiting for that sailfish to stick his hairdo up there and take the bait. Good luck to everyone fishing this month. I’ll sea ya on the water. Nice catch of dolphins and kingfish by this lucky angler on our sportfishing charter. Dan and Pat Okee again with the huge bull dolphin as well as the cow that was following close behind. 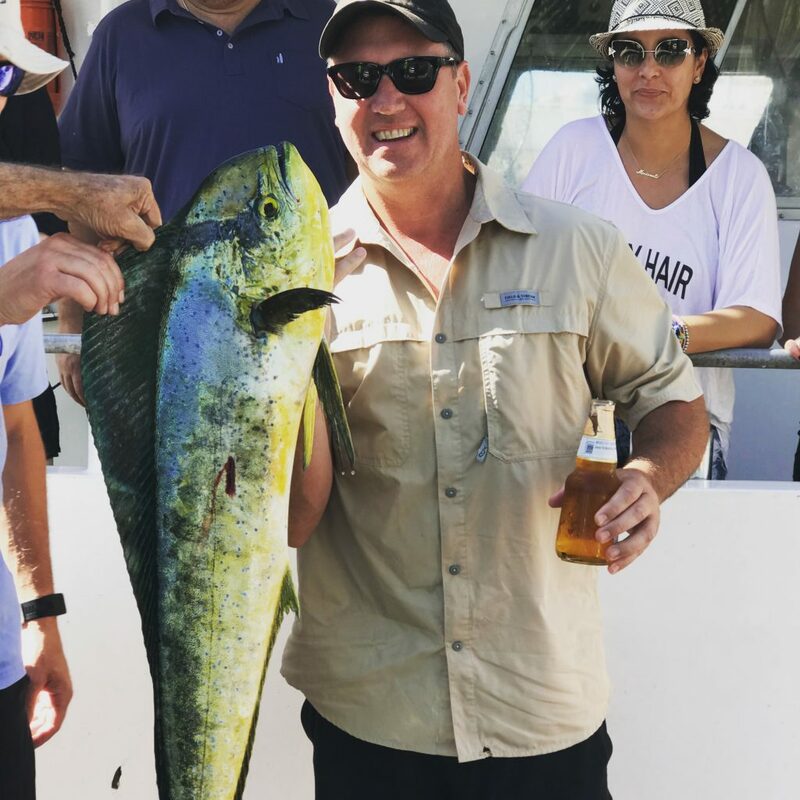 Nice dolphin caught by this group on an end of the year company party trip aboard the Mary B III.